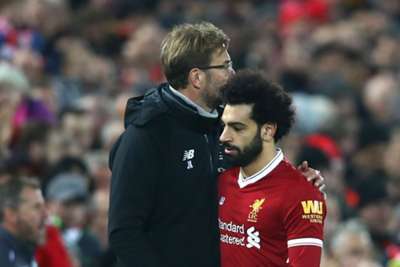 Jurgen Klopp does not want Mohamed Salah or Liverpool to change their ways as the Egypt forward chases the Premier League Golden Boot. Salah has scored an incredible 40 goals in his first season at Anfield, with 30 of those coming in the Premier League to put him four ahead of two-time winner Harry Kane at the top of the scoring charts. The former Chelsea, Fiorentina and Roma winger is favourite to pip Manchester City midfielder Kevin De Bruyne to the Professional Footballers' Association Player of the Year award on Sunday, having been named in the organisation's divisional best XI of the season this week. But as the plaudits continue to arrive for the 25-year-old, Klopp insists it is Liverpool's collective work that has helped to elevate Salah and his team-mates. "The main target for Mo is to finish in the Champions League [qualifying] spots and, in an ideal world, go to the final and win the final," Klopp said ahead of Saturday's trip to West Brom that precedes the first leg of next week's Champions League semi-final first leg against Roma. "We don't have to think too much about that. It's not that we start now trying to bring him into situations where he will score. We have to play normal football. "In the end, if Mo is at his best then he will be a goal threat. If he is in the right positions, he will score or not. "We got to this position because of the football we played, Mo came here because of the football we played. We don't need to change anything, we just need to carry on." Klopp on Salah: "No physical problems in the moment. Hopefully it stays like this because we need all the boys for the games." Klopp pledged to pick a strong line-up at The Hawthorns on Saturday despite Roma's keenly anticipated trip to Anfield lying in wait next Tuesday. West Brom are on the brink of relegation but a shock 1-0 win at Manchester United last weekend handed Manchester City the Premier League title, while they knocked Liverpool out of the FA Cup in January. "We have to line up a really, really strong line-up. We respect always the intensity of the season," said Klopp. "We respect West Brom, we respect the competition of the Premier League. We know we need points to be in the top four. "We need to be at our best, we lost in the FA Cup – I don't need to remind anybody of that. "After the game then we have to think about Rome, there is no other way."